I’ own all of their cds. And this one is as good as it gets. The songs are head bobbers and tor tappers. It’s solid and tight!! I love this album.!! Do yourself a favor and buy this one! You’ll be like me and you’ll want all their songs. They just keep getting better. I've heard them from the beginning and each album reinterprets the genre even better. If you want rockin Texas blues, this is the best there is. I love this new CD. Makes me want more! Also makes me want to smoke and drink and hang out with blues musicians. After a 4 year wait, our new CD is out. First, we want to Thank our fans for their patience and support during this time. We trust you will enjoy our new music. Also, Bryan and I want to Thank the many musicians who helped with this project....especially Buddy Whittington, Charlie Bassham, Red Young, James Pennebaker, Wayne Six , Mike Gage, Mike Kennedy and Chris Collins who played/sang on multiple songs.. Thanks to Mouse Mayes, Danny Cochran, Sonny Collie, Chuck Luscombe, Jerry Hancock, Bobby Wilcox, Gary Owen, Yolanda Walker and Glen Rothstein who also appeared on this album. 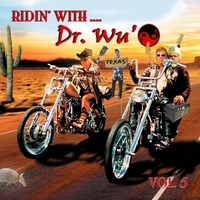 Ridin' with Dr. Wu' ! What a cool way to begin the new year! A really great album!!! Released in Texas around Xmas by Jim Ashworth and Bryan Freeze aka Dr. Wu' the CD arrived at the end of the year. And Vol. 5 is as good as the albums released before. I found the other CD's were more "rocky" while this ones more bluesy. Perfect played and well produced by Bryan Freeze the CD sounded bombastic. In dozens of years they took any Dr. Wu' album to show people what was Texas Blues!